I’m not sure how it started, but the slogan “We Are the 99%” is doing something that Democrats have failed to do and Republicans have feared for decades. Take a step back with me for a second and I’ll show you what Occupy Wall Street is doing that hasn’t happened over the past 30 years. And why. In 1971, Lewis Powell, then a member of 11 corporate boards, drafted a blueprint for the monied interests of the country represented by the U.S. Chamber of Commerce. Powell considered the business owners of America and capitalism itself under attack. I’m not going to get into if they were really under “attack,” but Powell felt like they were under attack and he convinced the U.S. Chamber of Commerce and others to follow his recommendations. I encourage you to read the Powell Memo for the full scope, but what Powell describes is a fear among businesses that the majority in our American Democracy sympathized little with businessmen and would eventually vote for a “socialist” government. To halt what he saw as an anti-business movement, he proposed influencing the educational and political systems with a pro-business agenda. Basically, government should give to the business owners, get out of the way, reduce their taxes, and then the business owners would in turn bring wealth and prosperity to everyone. Keep in mind the view that government should aid those at the top started out as an extremely unpopular minority view. When your arguments start from an extreme minority position, how do you effectively market your idea and form coalitions? The key number to get to in a Democracy is 51%. Republicans vs. Democrats: In this target segmenting, the segments are roughly 50/50. Straight vs. gay: Don’t know exact numbers, but it’s clear who’s in the minority. Religious vs. non-religious: According to a 2008 survey, only 15% claim no religious affiliation. Target the religious. Look at the recent fight in states like Wisconsin and Ohio. Governors like Kasich and Walker have introduced legislation to break the strength of public unions and limit their freedom to bargain so that management is effectively in control of decisions. This was not a popular viewpoint. It is, in fact, a viewpoint of the 1% and originally had large majorities against it. They reframed the debate to divide the market differently. They reframed the fight as unions vs. taxpayers. Because union members represent a minority (about 15% of the workforce in Ohio), you claim to be fighting for a majority, the taxpayers. This is how conservatives fight when they have unpopular arguments. This works about equally well with Republicans vs. Democrats. It’s why Republicans versus Democrats is largely a false divide. The monied interests would rather have us arguing Republican vs. Democrat (50/50 split) than Rich vs. Everyone Else (1/99 split). Democrats represent the U.S. Chamber of Commerce almost as well as Republicans. Don’t forget that Glass-Steagall was repealed under President Bill Clinton. Democrats simply play the game differently. Rather than trying to purposefully divide the electorate to play the statistical odds, Democrats try to appeal to a majority with a populist message. The trouble is that this populist message gets undercut frequently once they’re in office. A great example of this is the Affordable Care Act enacted by President Obama and the Democratic (at the time) majority Congress. Rather than implement a single-payer plan or a plan that included a public option, Democrats put forward a plan that keeps health care in the hands of the health care industry. Note that the idea of mandating health care insurance was originally proposed by Stuart Butler of The Heritage Foundation. That is, it was a corporate-approved plan. Also observe the failure of the Democratic Party to pass the Employee Free Choice Act. Note the strong opposition from corporate-backed organizations such as the U.S. Chamber of Commerce and The Heritage Foundation. Because of this conflict, Democrats constantly undermine their brand. During elections, they market to the 99%, but then often work towards the interests of the 1%. No wonder the voting public is cynical. Without a strong brand, Democrats win mostly in the face of strong reaction to the opposition party – 1992 and 2008 being the two most recent examples. The rich vs. the rest of us is the fight the 1% fear most. So why have we been so unwilling to fight this fight? 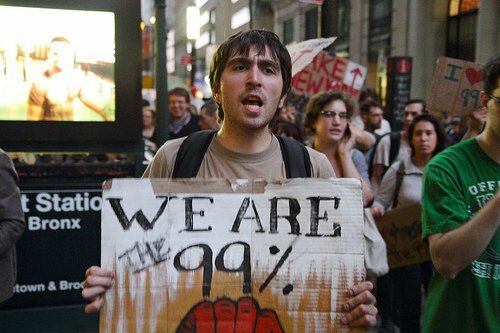 By claiming the 99% mantle, Occupy Wall Street is finally target segmenting the market effectively. As hard as this may be to believe, the 99% message may encourage some non-traditional (for Democrats anyways) allies who share the same frustrations: members of the Tea Party, small business owners, and members of the Republican party who may be dissatisfied with their party’s lack of new ideas for dealing with the economy. “We are the 99%” is a fight we should not back away from despite the attempts (and you know more are coming) to divide the electorate differently to keep those in power in power. And to keep our government focused on the needs of the 1%. Remember these “false divides” and the desired target segmenting (hint: 99/1%). It helps you determine who you want to win over and who to fight. Think about that the next time you’re considering calling someone a “teabagger” or arguing among any of the numerous false divides. Is that who your fight is really with? Are they in the 99% target market or not? Occupy Wall Street so far has picked the right fight. Let’s continue to follow their model.